Oliver’s Travels is a UK-based luxury travel agency that specializes in renting out luxury villas, castles, mansions, beach huts and cottages throughout Europe and the Caribbean. Their main appeal is twofold: first of all, they generally deal directly with the property owners themselves rather than hotel chains, so their prices are quite affordable considering how exquisite the accommodations are (about £40 per person per night, if you’re keeping score). Secondly, each and every one of the hundreds of places they list has been hand-selected by site owners Oliver and Ravi, or by their experienced staff, because it offers something truly unique and luxurious. This high standard of selection, from French chateauxs and Italian villas to Jamaican estates and Barbadian beach houses, helps narrow down travelers’ choices to only the best of the best so that they’re more likely to get the idyllic vacation they want. In the 11 years since it was founded, Oliver’s Travels has become one of the most popular and trusted names in online luxury holiday bookings. Like any smart booking agency, Oliver’s Travels has a very attractive affiliate program, and it’s something that you could make plenty of cash from with a little bit of effort on your part. 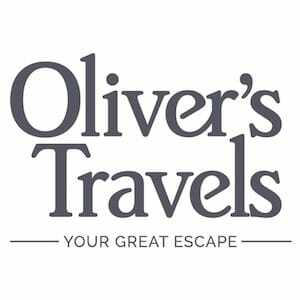 The really good news is that, to celebrate their 10th anniversary, Oliver’s Travels increased their base commission of £100 by 50% – and they’ve extended that special rate through to the end of the year. 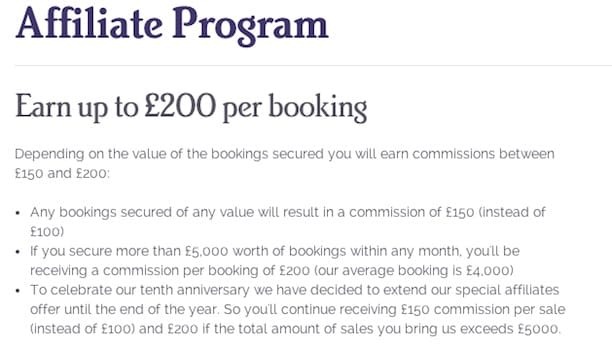 That means you’ll earn a £150 commission on every booking you provide, and that number rises to £200 per booking if you manage to score £5,000 in bookings or more within a given month. With an average booking of about £4,000 across their entire site, earning those £200 commissions shouldn’t be particularly difficult on your end. Best of all, they use 90-day tracking cookies which ensure that you’ll get the commission you deserve even if the customers you send dawdle a few months before deciding to make a reservation. This is a truly worthwhile affiliate program that I can easily see being very profitable for anybody with a decent travel site. You can learn more about Oliver’s Travels by visiting OliversTravels.com, facebook.com/OliversJournal, or @olivers_travels on Twitter. To go straight to their affiliate program page, click here, and if you’d like to admire some of their incredible luxury villas, check out their Pinterest page for plenty of photos.